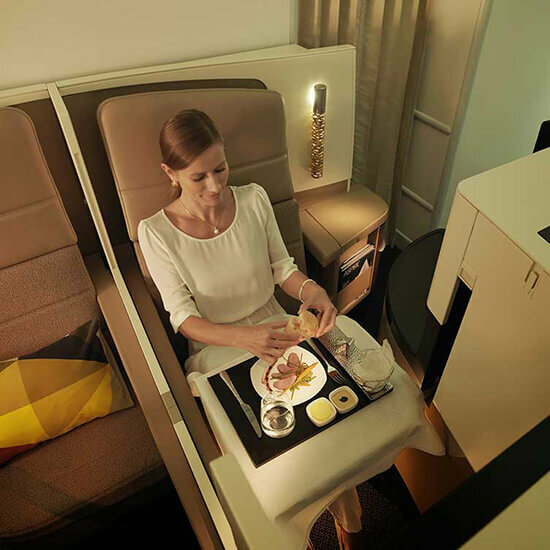 With unparalleled luxury permeating from every corner of Etihad Airways’ premium cabins, you’ll be sure to experience the best of the best, regardless of your tastes and budget. However, having now won awards for its Business Class cabin, it would be rude not to experience this award-winning cabin for yourself. …so what better time to book Business? Guests are treated to a 'privacy shell' with a six-foot long flat bed, complete with in-built massage function, plus an à la carte menu of five-star food and wine choices. Then there’s the entertainment. We’re talking 15-inch LCD TVs and noise-cancelling headsets to enhance the in-flight experience. Over 675 hours of hit television shows, classic movies and the latest music from around the world is loaded into the on-demand E-BOX system for your convenience, which can also be accessed using your personal devices. 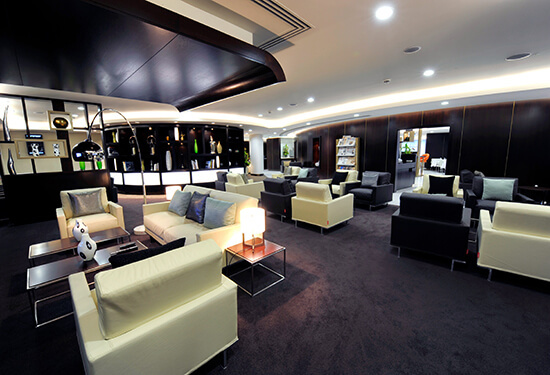 Prior to flying, Business Class guests are also granted lounge access. Thirsty for more luxury? Then the First Class cabin, First Apartment, First Suite or even The Residence will be sure to whet your appetite. 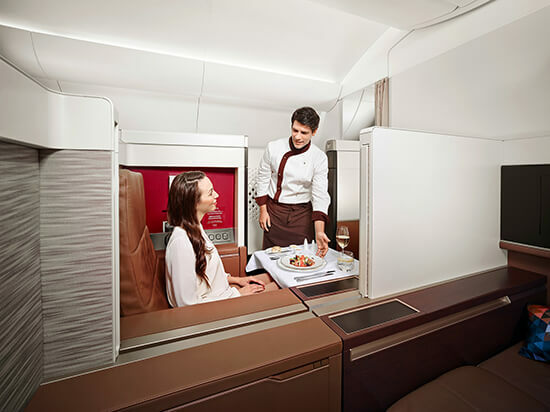 Upping the ante in luxury and privacy, the world's most luxurious flying experience debuts on Etihad Airways with the offering of The Residence and a new first class cabin First Apartments. The Residence is available exclusively on the airline’s new A380 which is due to operate daily flights between London Heathrow and Abu Dhabi. Upholstered with fine Italian leather by Poltrona Frau, the First Apartments feature a large living space (big enough to walk around in!) with an oversized armchair, ottoman, wardrobe, 24-inch TV, vanity cabinet, chilled drinks cabinet and room for two people to dine together. If travelling with a companion, wall dividers can be lowered to join rooms. 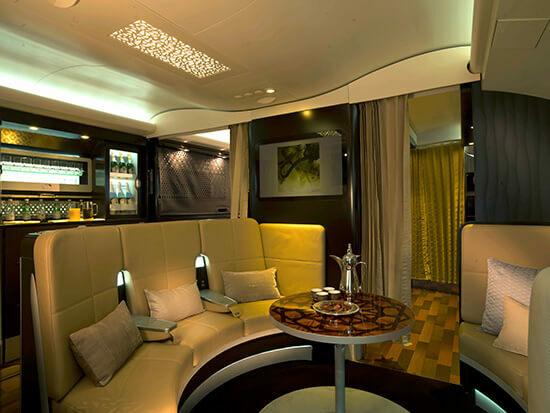 This is undefined luxury in the sky, exclusive to the Etihad Airways A380 experience. Enjoy a complimentary Etihad Chauffeur in over 30 cities before stepping into your First Suite, complete with stylish Poltrona Frau leather seats, exquisite fabric and finishes and ambient lighting. Each First Suite includes a personal wardrobe, chilled drinks cabinet and enough space to entertain a travelling companion. In-flight chefs will take you’re à la carte order and pair your selections with the finest wines in the sky. In-flight entertainment for First Suite guests includes a 23-inch widescreen for personal viewing using the E-BOX system, plus noise-cancelling headphones and connectivity to power your personal electronic devices. First Class guests also receive mobile phone and Wi-Fi access on selected routes and aircrafts. This is the ultimate. Luxury and privacy are taken to the next level with the three suites that make up The Residence. The living room area includes a double-seat sofa with ottoman, two dining tables, a chilled drinks cabinet and 32-inch flat screen TV. Meanwhile, the ensuite bathroom boasts personal bathrobes, exclusive amenities and a private shower. Finally there’s the bedroom, which comes complete with a double bed, Egyptian-cotton sheets and a choice of pillows. To secure your seat onboard this multi-award-winning airline of the year, speak to your local Travel Expert today or find flights online.